Below are cowboy, Western, and rustic candle holders for sale on Amazon and eBay. There is usually an excellent selection of different sizes and styles to make beautiful accents for home or business Western decor. 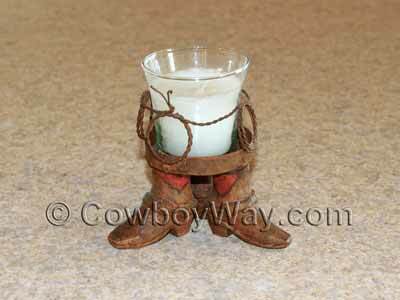 Below: A 3-inch tall (not including the candle) cowboy boot candle holder.